If we fix an appliance and it breaks down again during our ninety day warranty period, we’ll return for free and determine the cause of the problem. If the breakdown has anything to do with the original repair, we’ll fix it for free! If the machine is not worth spending any additional money on, we’ll give you back the original repair cost, less the regular service charge. For questions about our Money Back Guarantee or to schedule a service appointment, call us TODAY at (866) 611-4479! 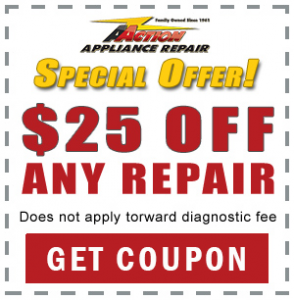 E-mail the Service Department for more info about Our Money Back Guarantee!